Asus had launched the Zenfone series in India in July 2014. The series manage to do quite well with the Zenfone 5 going head to head with the Moto G. This year it looks like Asus has a different strategy. 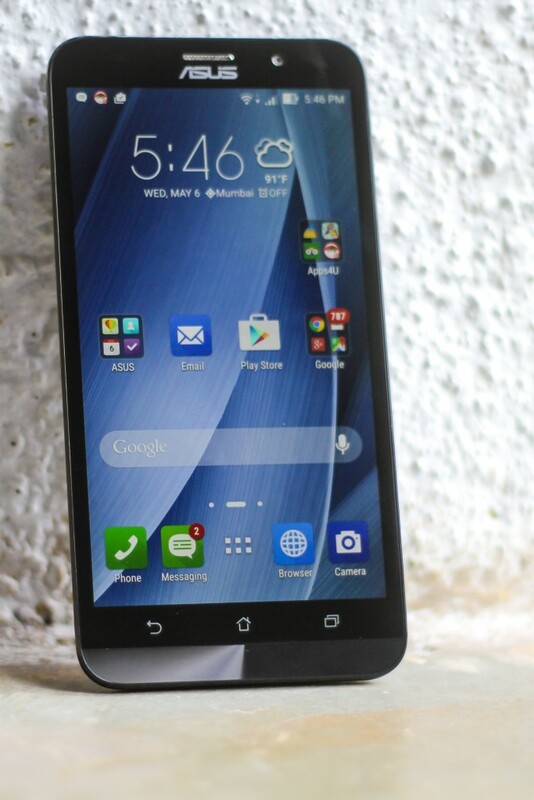 The Zenfone 2 looks like a product that wants to stand out instead of merely competing against others. That seems like a very good strategy but there is one little problem. 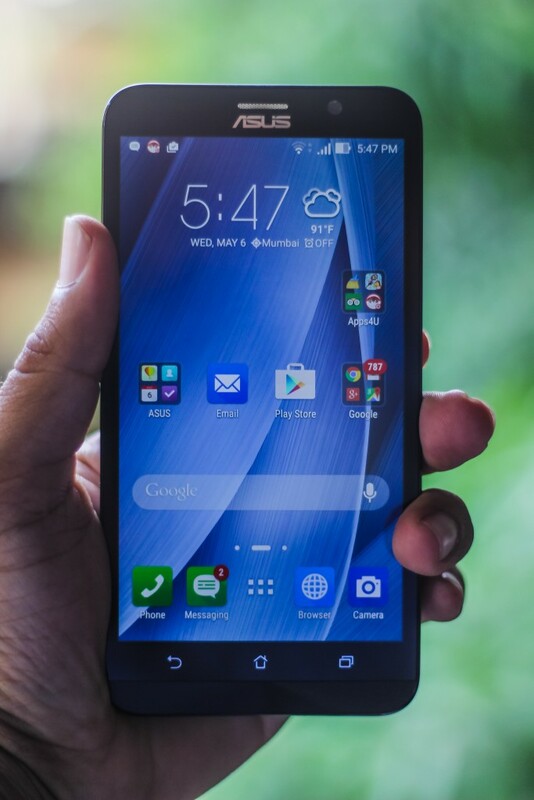 Asus has launched different variants of the Zenfone 2 making it hard for the customer. A different naming strategy may have helped. The device made headlines for being the first smartphone to have 4GB of RAM onboard. It was launched in India a couple of weeks back with pre orders starting almost immediately. Is it really worth all the hype? The Asus Zenfone 2 looks exactly like the other phones in the series. Size wise it fits in between the Zenfone 5 and the Zenfone 6. 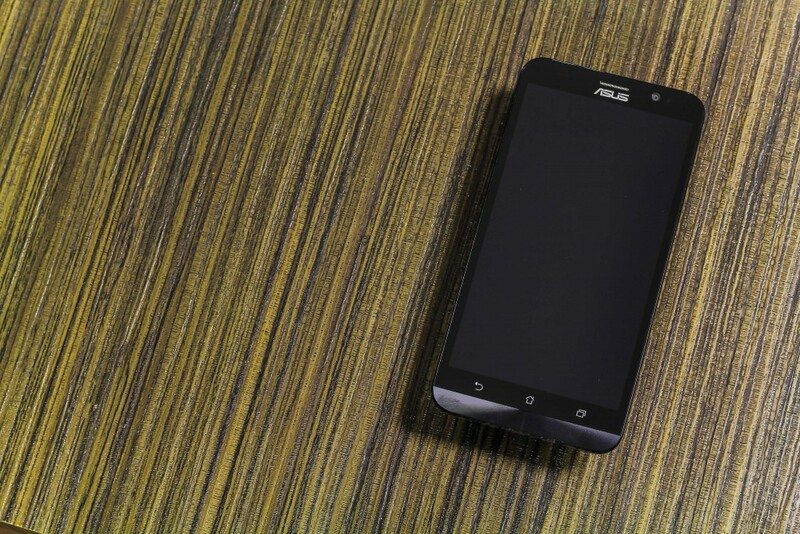 The device being a second generation phone in the series, a little design change would’ve looked good but Asus went with the tried and tested look. 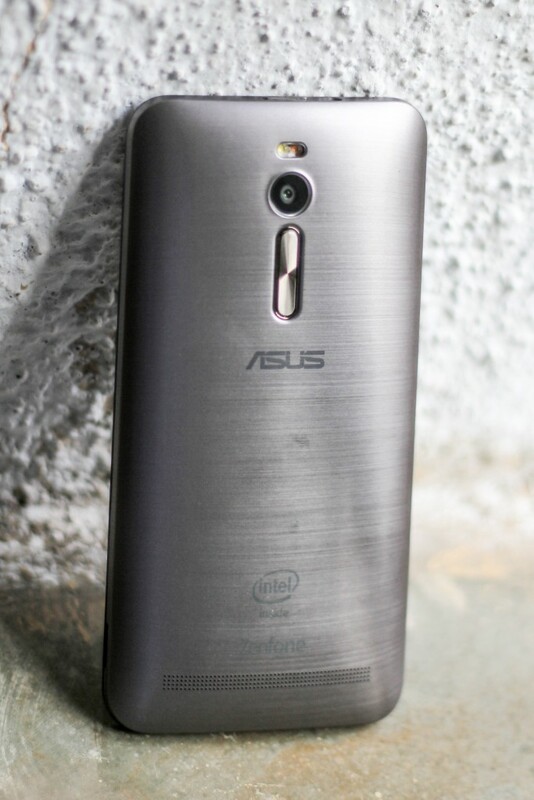 The metallic chin at the front seen on every other Asus phone in the market makes an appearance here as well. There are lots of little changes here and there like the back, which has a brushed aluminium like finish and reflects light beautifully. A major redesign is moving the volume buttons to the back and shifting the power button to the top. While most manufacturers are shifting the power button to the side to keep it easily accessible it is actually strange of ASUS to do exactly the opposite. The phone has a curved back which goes from 3.9mm of thickness all the way to 10.9mm. The curve makes it comfortable to hold in hand but also makes the phone look really big and bulky. The device does not rest flat on a surface and rocks like a seesaw. The phone weighs 170 gms and it is fairly comfortable to hold the phone with one hand. The button on the top is inconvenient and might need some shuffling to reach it. That said, the double tap to wake gesture is a god send that makes locking and unlocking the device easier. The Zenfone 2 packs in a huge 5.5 inch IPS display with a resolution of 1920×1080 pixels. The panel has good viewing angles but the glass is a little reflective. The whole display gets Gorilla Glass 3 protection which should keep it safe from minor scratches and drops. The phone has different display modes and also lets the user calibrate the display as they wish. An option to quickly toggle between these modes is also present in the quick shortcuts pane. The auto brightness seems to be a little conservative as it dims the screen down aggressively but overall its a good display. The ZenUI has been updated to work with Android 5.0 Lollipop. So while there are little changes the overall interface looks similar and retains important bits from Lollipop. It features priority notifications and the ability to handle interruptions. There is also a true silent mode where it mutes everything but unlike Nexus devices this lets Alarms go through; something that was required in the first place. The phone also gets Multi user mode something that manufacturers like Samsung, Xiaomi and HTC have skipped out on. The UI is minimalistic and there are very few apps that can be counted as bloat. Asus has taken a different approach and has listed each system app on the Google Play Store. As a result it gives them the power to update each app individually when required. So while other manufacturers wait and club all app updates, Asus rolls it out individually. The phone comes loaded with lots of features and gestures that can be used to launch apps when the screen is off. For example, you can draw a C to open the camera, or assign a W gesture for Chrome, WhatsApp or any other app you like. The overall experience on the phone is great and this comes second in line after Motorola for providing mostly useful additions to stock Android. And you can remove something if you don’t like it. Software aside hardware is where all the differentiation is at. The review unit we have here is a high end variant of the Zenfone 2. This comes with a 2.3GHz Intel Atom Quad Core Processor and 4GB of RAM. What that translates to is that the phone can handle MANY MANY apps before it slows down. For instance here the device has over 2GB of RAM free. That’s more RAM than what many devices come with. Asus has provided RAM cleaning which don’t seem required in the first place. The chipset is 64 bit enabled and as a result makes full use of the 64 bit support in Android 5.0 Lollipop. The device runs smoothly without stuttering or lagging. The Asus Zenfone 2 comes with a 13 megapixel camera at the back with dual tone LED flash and a 5 megapixel camera at front. The rear camera is blessed with Asus PixelMaster technology that helps the phone click better images in low lighting conditions. The camera app is full of different shooting modes and reminds us of Samsung phones. Modes aside, the camera clicks strictly OK images but nothing spectacular. Pictures clicked in artificial light appear grainy and aren’t very inspiring. The volume buttons can also used to click a photo. Storage isn’t much of an issue. The device comes in lots of storage options right from 16GB all the way to 64GB. There is also a 128GB version listed but we don’t have a lot of details on the product today. Irrespective of the internal storage all devices have a MicroSD card slot that accepts cards upto 64GB. The first thing we notice after removing the back cover is the NFC circuit. While the back cover is removable the battery on the phone isn’t. The phone has a 3000mAh non removable battery mAh battery and provides good backup. The phone could easily go for a day without needing charge. When it did require charging the provided fast charger ensured that the device was powered up quickly. The Zenfone 2 is a Dual SIM, Dual Active device which means that both the SIM slots are active at all times. The SIM 1 slot supports 2G/3G and 4G while the SIM 2 slot is restricted to 2G use only. 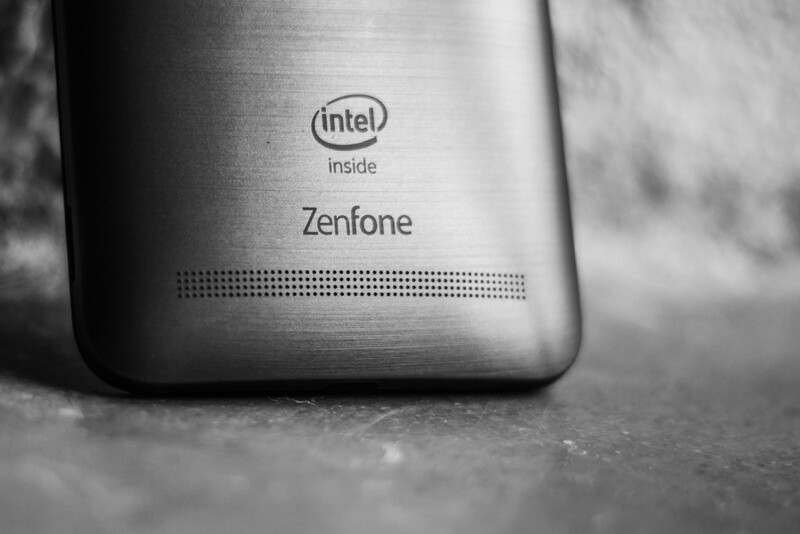 So what do we think about the Zenfone 2? The device is quite impressive on paper and can go through some heavy multitasking without sweating. The processor and RAM combination is quite good and the product feels powerful. If you want a non nonsense device that gets the job done, get the Zenfone 2. But not if you want a good camera, then look elsewhere. Also, Asus could’ve used a better strategy for naming these devices.